Have you ever felt helpless to keep your kids Christian? Have you ever said something like this: "I know there is no guarantee when it comes to raising children. 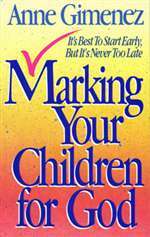 They all have to rebel, I just hope mine will come back to the Lord some day..." Author, pastor, and speaker, Anne Giminez, challenges parents who adopt this "hands-off" approach. She is convinced mothers and fathers must be active rather than passive and direct rather than indirect in shaping the character of their teenage children. Your prayers, example, teaching and training are just some of the ways He has given you for fulfilling this high calling.